Please join us for our next public Adopt-a-Beach™ cleanup at South Shore Beach. When: Thursday June 22, 6:00 to 7:30pm – anytime you can help during this time is great. This is the first our organized beach cleanup for 2017. Join us to help make South Shore Beach clean, meet friends and have fun! Meet on the paved trail at the large anchor near the northeast corner of the Park Pavilion. South Shore Park Pavilion is located at 2900 S. Shore Drive, Milwaukee. No experience is necessary. Gloves and trash bags will be provided. We need all the help we can get. ​Thanks for your help in advance! Please note there is not a regular meeting on June 13. We will host the beach cleanup this month instead. April Meeting – Earth Day Volunteers Needed Hi Friends, Our next meeting is Tuesday, April 11th, 7pm at South Shore Park Pavilion. We are hosting our 21st annual earth day education event on April 25. The event features environmental presentations and activities for over 400 local elementary school students. Volunteers are needed to help during the day of the event. Please join us at our next meeting or contact us if you would like to help. Thank you! Our next meeting is March 14th, 7pm at South Shore Park Pavilion. We are hosting our 2017 earth day education event on April 25. The event features environmental presentations and activities for over 400 local elementary school students. Volunteers are needed to help during the day of the event. Please join us at our next meeting if you would like to help. Thank you. Happy Valentines Day to our park friends. In honor of the day, we will not have a meeting this month. We look forward to seeing you in March on the second Tuesday of the month. Our next meeting is Tuesday, January 10th, 7:00pm at South Shore Park Pavilion. The meeting will include planning for our 22nd annual Earth Day education event. 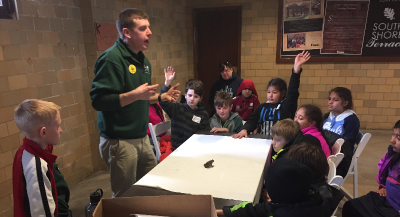 This event brings as many as 500 students from 10 area schools to South Shore Park to learn about good environmental practice. Volunteers are needed to help coordinate and manage portions of the overall event. Please join us at our next meeting if you are interested in the event and would like to help. Happy Holidays to the Friends of South Shore Park. We will NOT have our regular friends group meeting at South Shore Pavilion on December 13. Please join us for our next meeting Tuesday January 10. Happy Holidays to All and see you in the new year.